The Special Relationship is a made for Television movie produce by HBO Films. 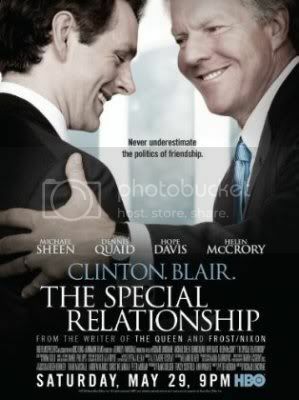 The movie focuses on key events during that particular period such as the Monica Lewinsky sec scandal involving President Clinton and the humanitarian crisis in Bosnia in which its resolve proved to be possibly the most significant achievement by Tony Blair during his time as Prime Minister of Britain. I’ve never been one for politics, I hardly ever follow it but I often enjoy these Hollywood political dramas. It’s far less boring than the real politics and the politicians being portrayed actually have character and aren’t nearly as dull as their real life counterparts; although it may not always be accurate, but hey that’s show business. This is a film driven by great performances. You pretty much know already how the plot will pan out being that it’s based on period of history. This enables the main focus to be on the interaction between these two powerful world leaders. Michael Sheen and Dennis Quaid are perfectly cast and have great on screen chemistry. They are both portrayed as two very likable men, even with Clinton’s discrepancies as a husband and world leader. I found myself becoming quite fond of them both. And it’s intriguing to watch their professional relationship slowly develop in to a close personal friendship throughout the course of the film. Also I must mention the beautiful Hope Davis as Hillary Clinton who is magnificent. I’ve been a fan of Hope Davis for years and although a supporting role I think this is one of her best. I enjoyed this movie immensely; it does get a little slow half way through but however I think could have been a little longer, some of the events the film touched on felt a little rush and could have been explored much further. I've only seen The Queen. I'd like to see The Deal, but if only I could find it. Gordon Brown didn't last long didn't he. Hell no. Useless sod. Ever see Top Gear? Jeremy Clarkson got in trouble.. as usual... for suggesting we had a "one eyed Scottish idiot" in office". Allegedly. I haven't seen Top Gear but I remember hearing about that episode.